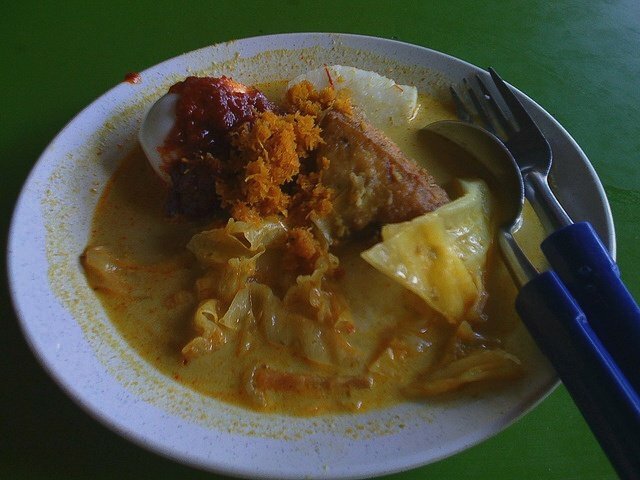 In Singapore, Lontong is a dish itself – where the rice roll is cut up into bite-sized pieces and served in a coconut vegetable stew; similar to Sayur Lodeh, and topped with sambal and toasted coconut – photo below (kerisik). However, Lontong is actualy the term most familiar internationally referring the Rice Roll only. There are ready-made lontong available in Singapore which cost about $1.60-$2.00 at supermarkets. Combine grated coconut with warm water. Squeeze out coconut milk. Heat 6 tbsp oil in wok till hot. Stir-fry ground dried chilies, dried shrimp, turmeric and candlenuts till fragrant. Pour in coconut milk and bring to boil over moderate heat. Add yam beans, long beans, cabbage, lemon grass and galangal. Cook till vegetables are softened. Stir in deep-fried bean curd cake and salt. Arrange compressed rice cakes on serving dish. Add vegetable curry then sprinkle with grated coconut. Top with halved eggs. Serve with chili pate for those who like it hot. Rinse broken rice and soak overnight in water. Line a metal tin with banana leaf or cloth then pour in the rice. Place the metal tin in a pot of boiling water and boil for 60 minutes. Leave it to cool completely before cutting it into pieces. Thanks for the receipe, may I know the ingredients given is for how many people? Any chilli paste receipe? for 4-5 pax. put it this way, every 1kg of main starch or 1kg main course dishes would serve up to 10 pax. As in chilli paste, im sure you are refering to "sambal tumis". How do I keep the rice in the metal tin during boiling. Please advice. phyllis – you should line up the metal tin upwards, verticaly. Do not forget to seal the top part. The easiest way is to use tooth-pick. i have updated 3 videos, steps of making lontong. hope u guys like it.